Two satellites are buttoned up on top of a Soyuz rocket for launch Friday to join Europe's Galileo navigation network, a civilian-run counterpart to the U.S. military's Global Positioning System. Friday's liftoff will kick off a rapid-fire series of launches for the Galileo navigation system, with 20 more satellites on track to launch before the end of 2017 to build out the network. The objective of the $7.2 billion Galileo program, which is run by the European Commission with support from the European Space Agency, is to develop and deploy a navigation system independent of the U.S. military's fleet of GPS satellites, which could be shut down at the order of the Pentagon. Launch of the next two satellites, the fifth and sixth in the Galileo network, is set for 1227:11 GMT (8:27:11 a.m. EDT) Friday aboard a Soyuz rocket from the Guiana Space Center, a European-run spaceport on the northern coast of South America. Liftoff will occur at 9:27 a.m. local time in French Guiana. Launch was delayed from Thursday to wait for inclement weather to move away from the space center. It will be the ninth flight of the venerable Russian launcher from French Guiana since 2011, when Soyuz missions from South America began under the auspices of Arianespace, the French launch services firm. Russian launch crews, managers in charge of the Galileo satellites, and officials overseeing ground systems at the spaceport gave the green light to continue final preflight preparations during a customary launch readiness review Wednesday. 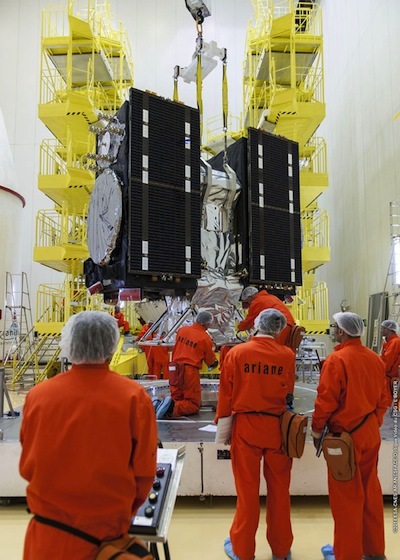 The two Galileo navigation satellites are mounted side-by-side on top of the Soyuz launcher. With a full load of maneuvering propellant, each satellite weighs 730 kilograms, or 1,609 pounds. The three-stage kerosene-fueled Soyuz ST-B rocket, flying in a "Europeanized" configuration with modifications to permit launches from French Guiana, will boost a Fregat upper stage and the two Galileo satellites on a suborbital trajectory in the first 10 minutes of the launch. 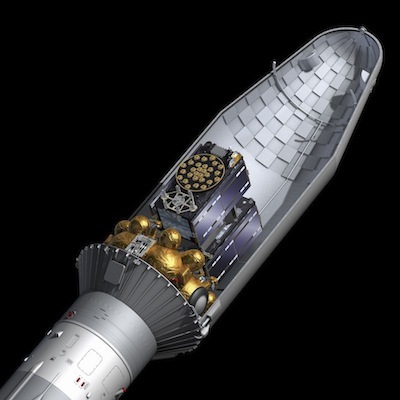 The Fregat stage's main engine will ignite two times to place the Galileo satellites in a circular orbit approximately 23,500 kilometers (14,600 miles) above Earth with an inclination of 55 degrees. Separation of the satellites is scheduled for 1615 GMT (12:15 p.m. EDT; 1:15 p.m. French Guiana time). The spacecraft aboard Friday's flight are the first two satellites to launch in Galileo's Full Operational Capability, or FOC, phase. Four satellites launched in 2011 and 2012 validated the Galileo concept -- in space and on the ground. "We are now entering a new phase we call FOC -- Full Operational Capability -- which is devoted to the full completion of the constellation," said Didier Faivre, director of navigation programs at the European Space Agency. "With a quite impressive cadence of launches, we expect to launch six-to-eight satellites per year starting tomorrow." The European Commission, the EU's executive body, and ESA have launched or contracted for 26 Galileo satellites. Officials say the network needs 24 satellites to be fully operational. With a full complement of spare spacecraft in orbit, the fleet will be consist of 30 satellites. The satellites will be spread into three orbital pathways to ensure global coverage. Faivre said officials are pleased with the performance of the four existing satellites, which will be integrated into the operational Galileo constellation, despite an anomaly that has knocked one of the craft offline. Javier Benedicto, ESA's Galileo project manager, told reporters Wednesday that the Galileo FM4 satellite has a "permanent degradation" in two of its three frequency bands. Engineers are still investigating the root cause of the anomaly, but teams have ruled out any risk to the satellites launching Friday. Each satellite transmits 10 positioning and timing signals to users on the ground via three L-band frequencies. The Galileo satellites are fitted with hydrogen maser atomic clocks, keeping time accurate to a few billionths of a second. The accurate timekeeping is necessary to gauge the distance between the satellites and users on the ground. 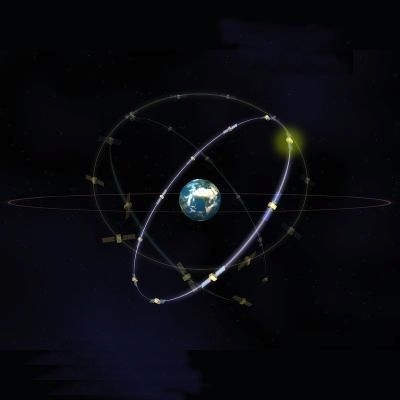 With four satellites visible to a ground user -- one for latitude, longitude, elevation and time -- the Galileo system can render a position and time estimate independent of GPS satellites. The Galileo system is designed to be interoperable with GPS and Russia's Glonass navigation satellites. With each new Glonass satellite launched and commissioned, users will see accuracy improve as more navigation satellites are in the sky at one time. "A combined GPS-Galileo receviver can bring a specific spacecraft into a navigation position solution," Benedicto said. "There is no need to wait for a declaration or such. You can use the spacecraft one-by-one as they're being declared operational." The Galileo satellites also host search-and-rescue antennas to receive distress signals worldwide. Using Galileo's navigation payload, officials say the constellation can ensure first responders know the location of the source of the distress signal with an accuracy of 3 meters, or about 10 feet. "The advantage of the search-and-rescure payload on Galileo provides for real-time detection of distress beacons and the real-time determination of the location of a person [in distress] with a very high level of accuracy, which will improve significantly the rescue operations," Benedicto said. After Friday's launch, 20 more Galileo satellites are being assembled and tested in Europe before shipment to the Guiana Space Center. The next two spacecraft are scheduled for liftoff on a Soyuz rocket in December. The satellites are built in OHB System of Bremen, Germany. Each spacecraft's navigation payload is supplied by Surrey Satellite Technology Ltd. of the United Kingdom. "The challenge today is more on operations, cadence, continuity and maintaining such a constellation, which is quite new for Europe," Faivre said.